ADEPTT: Such great heights: ADEPTT goes alpine in Spain. 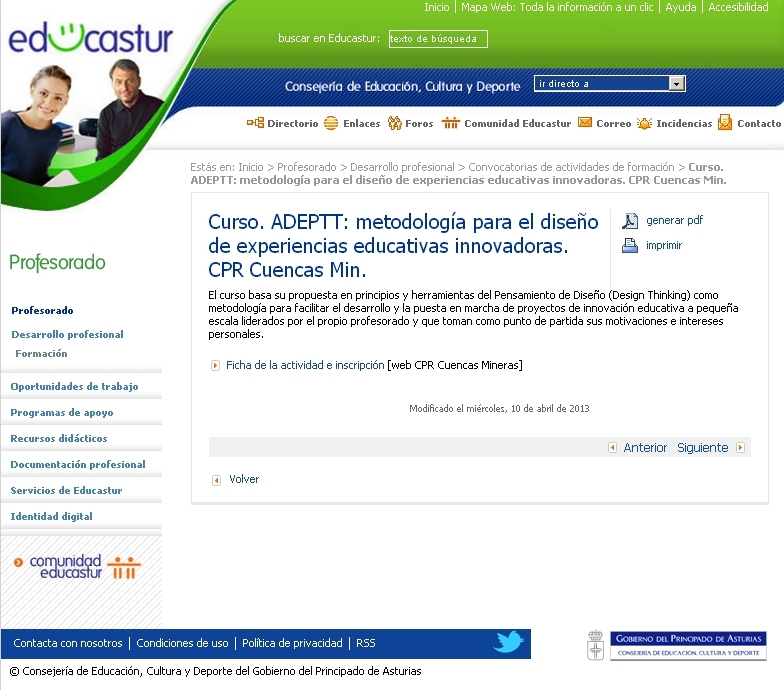 This post summarises ADEPTT pilot experience in Asturias, a spanish region with a well-known reputation for Enterprise Education in all levels of the education system. A regional action plan, “Off the shelf” solutions (mainly in the shape of mini-company programmes), fantastic-looking teaching resources, a vision of the entrepreneurial “übermensch” with its long wishlist of skills attached and specific teacher training to make this happen in schools are the main features of what’s become the well-trodden path of Enterprise Education in Asturias. Stepping out of it was our main motivation to participate in ADEPTT project and this is how we’ve done it. 1. Explore and understand creativity, innovation and entrepreneurship development in an educational context. 2. Identify research and appraise an entrepreneurial opportunity for teaching a particular subject, and pitch the idea to peers and/or other stakeholders. 3. Prototype (produce a novel and fully functional model) and test the idea engaging potential users and real stakeholders. 4. Reflect upon and evaluate the application of the entrepreneurial opportunity. A common assessment protocol was derived from this list of learning outcomes. A rubric was created to enable course participants rate their confidence on achieving these learning outcomes before and after the training took place. Previous work had led to the identification of the four basic building blocks of enterprising teaching: Creativity, Reflective Practice, Community Engagement and Learning Environment (CRCL) and course contents were designed accordingly in order to fit this model. All piloting partners agreed to stick to the Learning outcomes, CRCL model and assessment protocol as essential ingredients in all pilots. As long as these ingredients were present partners were given freedom to design and craft their own training proposals. Back in Asturias, some decision-making was needed. Preaching to the converted was the first thing we wanted to avoid. Thus a hazy title was deliberately chosen. 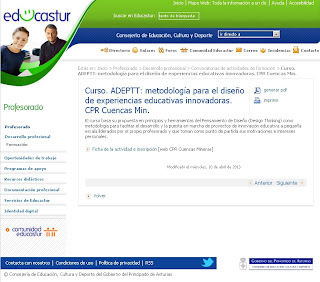 The pilot course was announced in the website of our partner in crime, CPR Nalón-Caudal, one of the branches of the Professional Development Service for teachers in Asturias under the hazy title: “ADEPTT. A methodology for the design of innovative educational experiences.” The strategy bore fruit and a mixed group of 15 teachers and education professionals signed up (Primary (3), Secondary (6), VET (4), Career Counsellors (2).All of them taught non-economic subjects and just one of them acknowledged previous experience in EE. Learning outcomes 2 and 3, asking teachers to identify opportunities, pitch, prototype and test ideas with potential users and stakeholders was an absolute “must” in our list of priorities and fits neatly with the “turn ideas into action” imperative so dear to Enterprise Education experts and policymakers at European level. As it happens VALNALON has recently devoted some time to experiment with the use of Design Thinking to bring forward innovation in the classroom so the use of some of the strategies just came as natural coupled with elements of Project Based Learning that were also added to the mix. While designing the activities we had a sort of Bovine Excrement Bingo in mind and we committed to do our best to avoid terms such as: Entrepreneurial spirits and haunted houses, narrative fallacies in the shape of entrepreneurial success stories, wishlists and pseudoscientific tests of entrepreneurial skills, Zen quotes and creepy tales about the upcoming overtake of the world by the Chinese. We were not brave enough to avoid the Post-It Imperative though (we did not want to offend the whole pantheon of entrepreneurial gods) but one thing we took great care in was providing some theoretical underpinning or evidence-based research AFTER any practical exercise (involving Post-Its or not) included in the training. Basecamp: Firstly participants were asked to share stories about their perceptions and experience in teaching, work context, most memorable moments, things they are interested in. This is all about Reflective Practice, one of the elements of the CRCL model. At this stage participants realise their backpack is not empty at all. It’s got some interesting gear that will be of great use during the climb. With this information basecamp was set up and it was time to start identifying opportunities or summits worth to be climbed. This was an individual task although some participants with shared interests worked in teams. At this particular stage he role of creativity in education (another element of the CRCL model), divergent and convergent thinking strategies and basic principles and stages of design thinking were presented to teachers. Day 1 comes to an end and participants are asked to observe and engage with people in order to build empathy and spot an adequate opportunity that could be transformed into a project idea. They were given a week to interview at least 5 different users and/or stakeholders. Possible climbing routes. Interviews and observation during the previous week led to the framing of the challenge they wanted to tackle, or metaphorically speaking, the peak they wanted to climb. Participants were asked to switch to divergent mode and produce at least a basic draft of 3 different ideas, 3 possible climbing routes to reach the summit. These 3 ideas were further enriched with comments from the rest of course participants using the 6-3-5 technique. This exercise worked as a fantastic introduction to a research paper on the benefits of parallel prototyping in the generation of creative and disruptive ideas and the need to avoid premature articulation. Convergent thinking led to idea selection using a dot-sticking technique where teachers were asked to consider the impact of different criteria such as desirability, feasibility and viability in the “innovativeness” of the ideas selected. Attempt to summit . At this stage participants were expected to prototype selected ideas and pitch them to their peers. Four key questions are introduced in order to help teachers scaffold their ideas: “What needs to be done next?”, “What do we already have?”, “ How are your going to engage your users?” and “Who can help us?” Community engagement was introduced through a stakeholder mapping exercise and the question “How Might We Connect students Personal Interests with Academic Contents?” sparked a discussion about the changing landscape and blurring boundaries of Learning Environments. In the session wrap-up teachers were reminded they had four weeks to venture into the wild and make an attempt to the summit no matter how high they reach. Back to the basecamp. Four weeks later we sat around the fireplace and the bruises and the ragged clothes were shown, enthralling tales of avalanches and storms, sleepless nights out in the cold were told and in some cases proofs of summit were provided. Projects devised by teachers covered a wide range of topics. 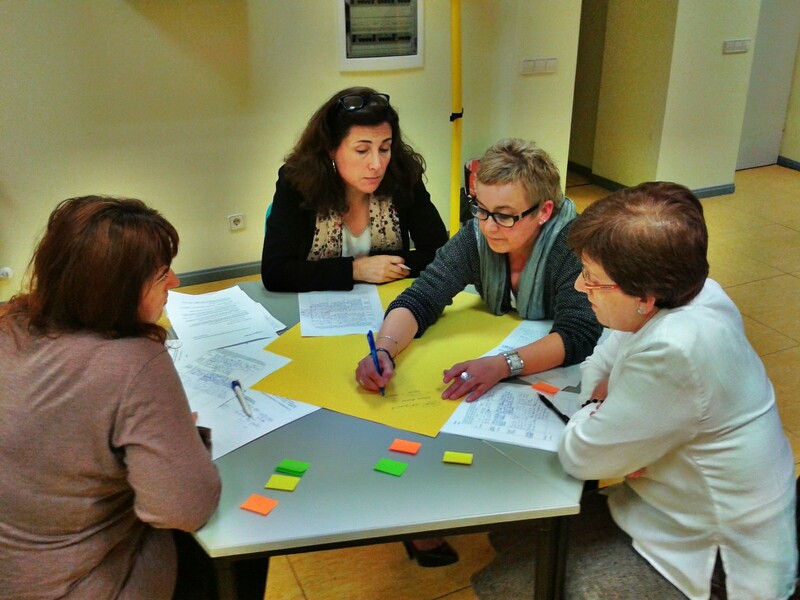 To give you a flavour Nieves, a primary school teacher came up with the project idea “Fuera de…/Out of…) which aims at developing primary school kids mathematical competence using real contexts. 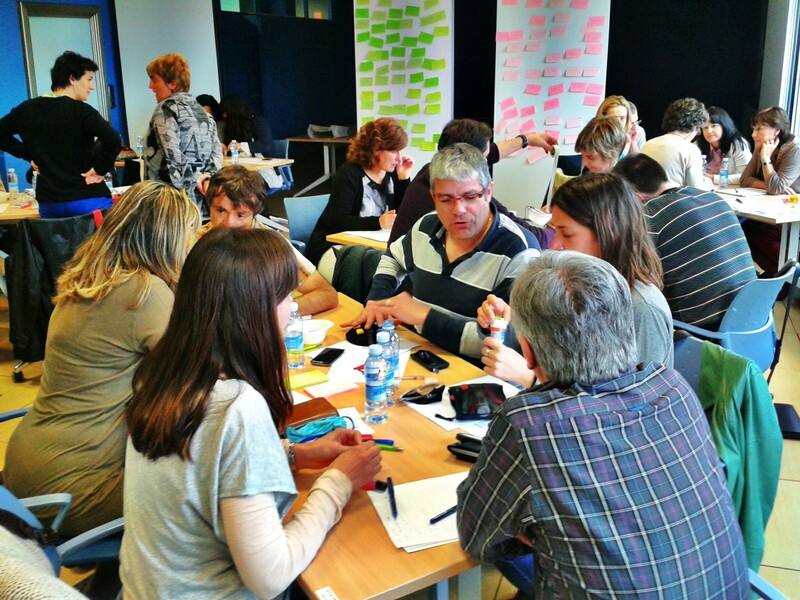 Carlos, a secondary school PE teacher combined coaching and technology to craft a emotional education project for year11-year12 called “Emotional Zombies” and Andoni, a VET teacher in the Basque Country managed to design and carry out KUDEA-TU, a P2P teaching project where a group of VET students organised a creativity workshop for Secondary Schools. But above all, this was an opportunity to discuss and evaluate the whole ADEPTT learning experience. ADEPTT is not a shining path for enterprising teaching, not even a success in the making. It’s just a prototype from which we have derived some useful lessons on how to expand the battlefield of enterprise education in close collaboration with teacher participants in the training to whom we will be always grateful. Training will be done again in Autumn 2013. In the meantime some changes in structure and content will be introduced so as to make sure teachers have enough time to put into practice their project ideas throughout the course.